In an unprecedented move promoter Oscar De La Hoya has issued an open letter to fight fans to dismiss the criticism levelled against his boxer Saul ‘Canelo’ Alvarez, who handed Gennady Golovkin his first professional defeat in their highly-anticipated rematch for the WBC, WBA and Ring magazine middleweight championships at the T-Mobile Arena in Las Vegas, Nevada on Saturday night. The head of Golden Boy Promotions believes Alvarez has been unfairly targeted by sections of fans who are holding a grudge after the 28-year-old Mexican’s unpopular draw against Golovkin last September and subsequent failed drug tests. The originally scheduled May 5 rematch was cancelled after Alvarez twice tested positive for the banned substance clenbuterol. Alvarez received a six-month ban from boxing backdated to the time the tests were conducted in February. One of the most contentious issues surrounding the first fight was judge Adalaide Byrd’s inexcusable card of 118-110 for Alvarez. The veteran Vegas judge was Robinson Crusoe on that one, with judges Dave Moretti and Don Trella scoring the fight much closer at 113-115 and 114-114 respectively. 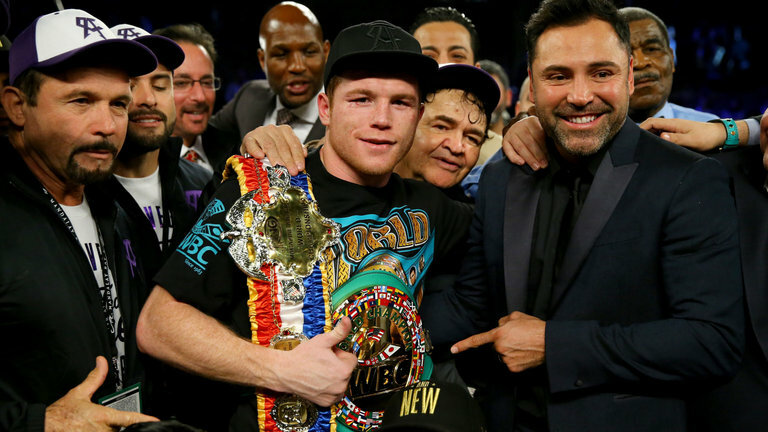 “Saddled with a judge’s card of a year ago that he had nothing to do with; the pressure of millions of fans watching; and what many were describing as a must-win to stay relevant, Canelo delivered a near-flawless fight,” De La Hoya said. De La Hoya went on to answer specific comments levelled against his boxer by a subsection of fight fans and the Golovkin camp. “Though I don’t think this deserves a response, here are the facts: The three judges were chosen by the Nevada State Athletic Commission. Given the result of the first fight, NSAC was under a lot of scrutiny to come up with the fairest group of judges possible. For the first time I know of, GBP and team GGG were even allowed to approve a pool of judges. They saw what everyone else did; a close, competitive fight and scored it exactly that way,” said De La Hoya. Tom Loeffler’s statement that he doesn’t know if Golovkin can win a decision in Las Vegas. “Perhaps Tom is just looking to make GGG feel better, but regardless this is maybe the most disappointing comment, because it comes from someone who knows the sport. Of course, GGG can win a decision in Vegas. But 22,000 people aren’t going to crowd into the T-Mobile to watch Golovkin fight and blast out the likes of Dominic Wade, Willie Monroe Jr, or Vanes Martirosyan. He is going to need to fight a higher level of competition – and then fight better than his opponent – to earn a victory in the mecca of boxing,” said De La Hoya.